Get that trans out and fix that turd. 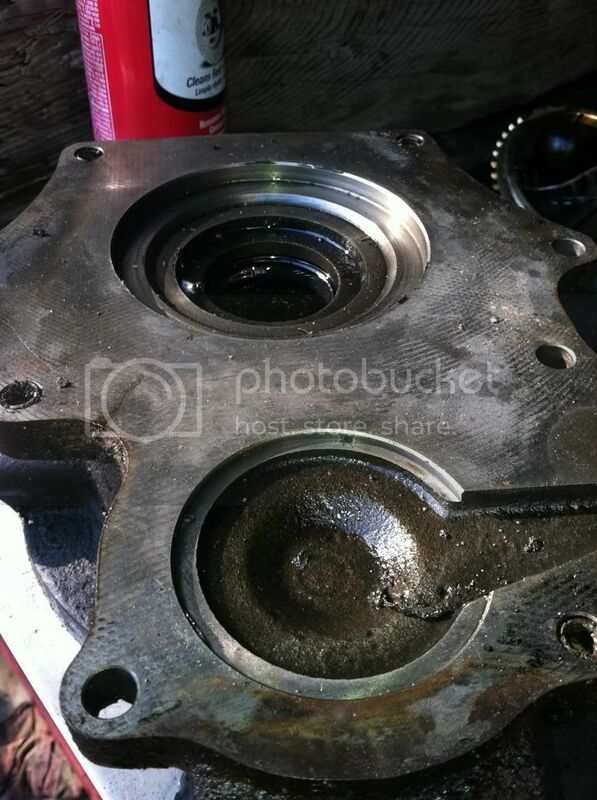 ...this is how I do the rebuild on MY trans and this does not mean that it is the proper procedures. Its my way. First thing you need to do is find a good pair of safety glasses that fit your face and are clear enough to see thru. You don't need the google kind that make you look like some kind of science geek. Just a decent pair that won't aggravate your nose or ears,the less irritation,the less chance you'll pull them off. Tools for teardown and assembly. Now the yoke,tail housing and its bolts. Don't forget to pull the speedometer gear and housing. Under there should be shims for the counter shaft and main/output shaft. Also,if your working on a 2wd, there is two spacers and a speedometer drive gear. 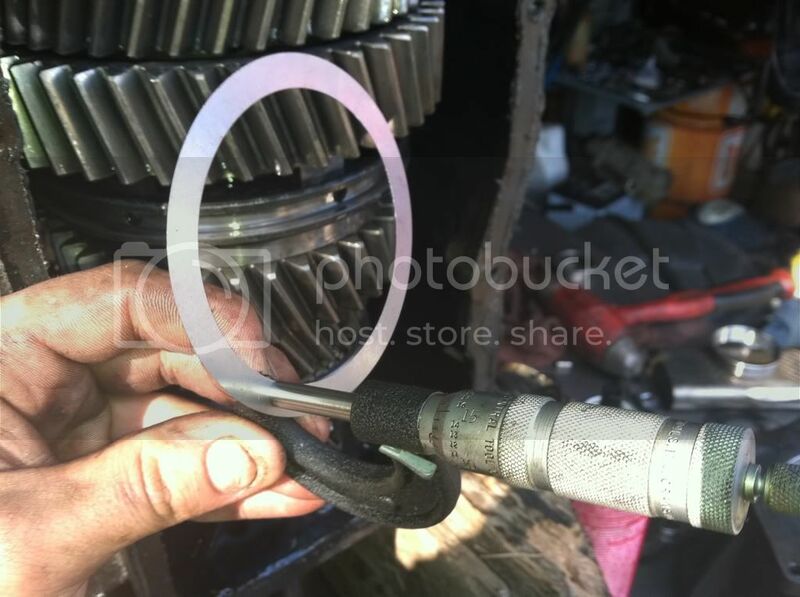 Now we have a good look at the counter gear and reverse idler. Last edited by ellis93 on Fri Jan 05, 2018 11:23 am, edited 3 times in total. Take a drift pin,brass is my choice,and carefully drive it forward. The shaft moves inside of the counter/cluster gear. 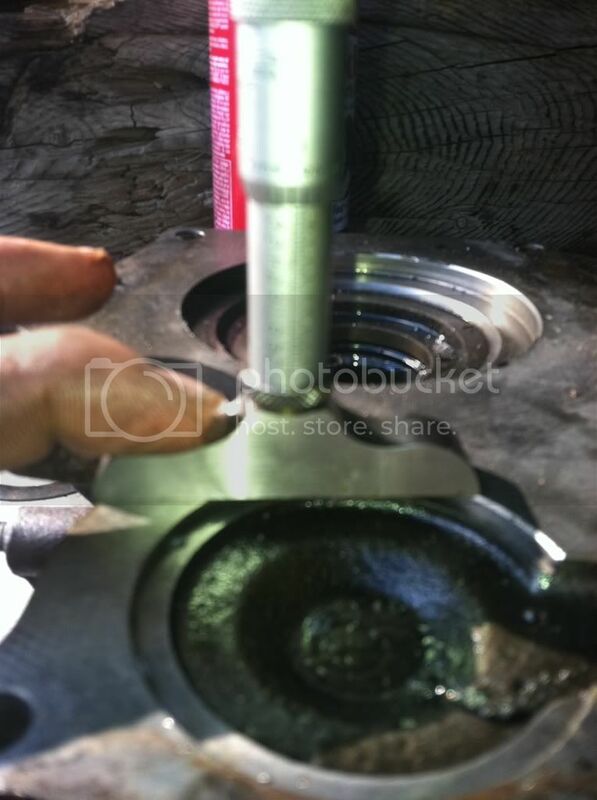 Reason you drive it forward is to pop the sealing cap out of the front bearing journal to revile 2 other snap rings. One that holds the front race in. Now once the caps out of the way remove the big snap ring. I now want to remove the reverse idler and its parts. There's a bolt on the outside of the case,it comes out first so I can angle the shaft to drive the roll pins out easier. Now that the case is empty I turn all my attention to the mainshaft. I start by cutting the pocket bearing cage and race. After I've got rid of the cage and rollers I slice the race carefully,not cutting into the shaft or 3/4 syncro hub. You don't need to cut it more than 3/4 way,you'll take that chisel and hammer to split it the rest of the way. After its split then it'll slide off with a little persuasion with a pry bar or screw driver. Now another snap ring that holds the 5th/reverse syncro hub on. Remember PITA if it comes apart. These four pieces are the first to be scrubbed clean of dirt,oil and shavings. Before you slide the 1st gear on you'll need to remove the old syncro,I pry it off EVENLY and put on the new. This gear there are roll pins that have they're holes drilled all the way thru. Bump them out and back in thru the new syncro first. 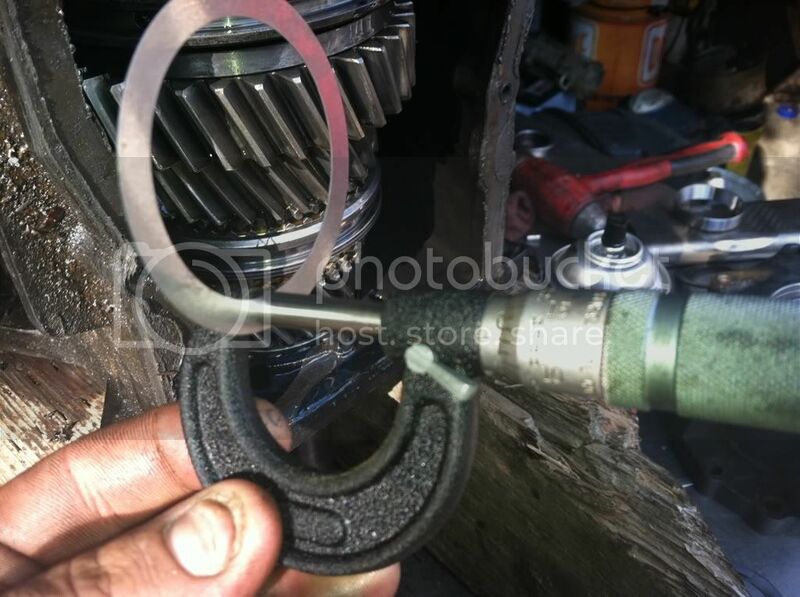 Slide the gear on and find its retainer and snap ring. It may not matter but I always make sure to keep the old surfaces against the same places. 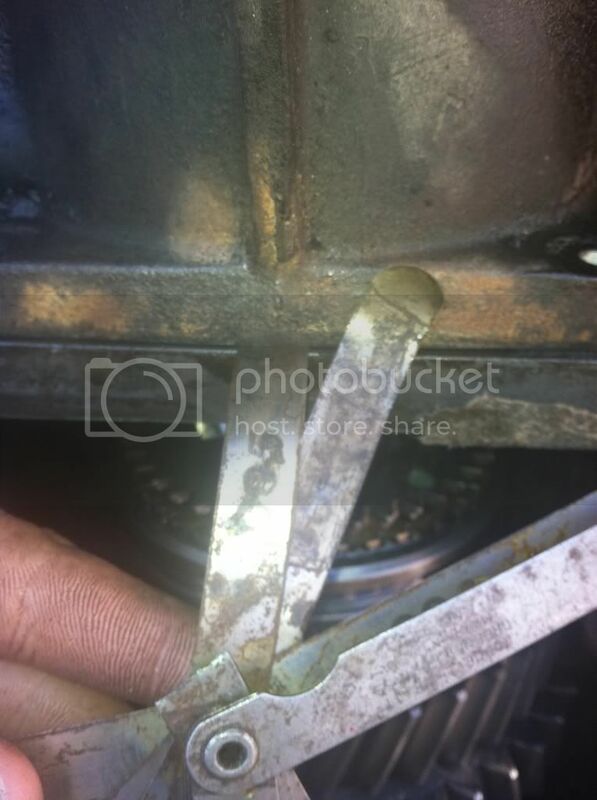 This pic shows where the needles and bearings rode against the retainer. And I drive it down evenly and with small taps,all the way around till it seats. after you get the retainer down,now the snap ring. I bump around it with my pin punch to make sure its seated all the way in its groove. After this there's another needle bearing and the reverse gear. The next thing will be the reverse's syncro and the syncro assembly. You'll need to pay attention to the hub because there is a thick side and it goes down into the reverse gear. Now for the rear bearing,usually I use a press to mash them on but since most folks don't have one in their back pocket I did this to show you can do it without. I drove in on using my brass drift and even,medium forced blows,around the inner bearing race. I was careful of the bearing cage, to avoid any contact with it, it can withstand some but its better to stay away. After that, the rear portion of the shaft is finished and its time to flip it over and assemble the rest of it. Replace the 1st gear syncro,not as easy as the 2nd gear. Its roll pin holes are blind,meaning they're not all the way thru the gear. You'll have to remove the old syncro with a screw driver or chisel and drive the new one back on REALLY carefully. You'll have to keep close to the holes in the syncro when installing it to keep the syncro from warping or binding. That could cause nasty shifting characteristics. Last edited by ellis93 on Fri Jan 05, 2018 11:27 am, edited 3 times in total. Now that the mainshaft is together I turn toward the case and reverse idler. Once the bolt is started,drive in the last roll pin and it should look like this. nows the time to drop in the counter/cluster gear. 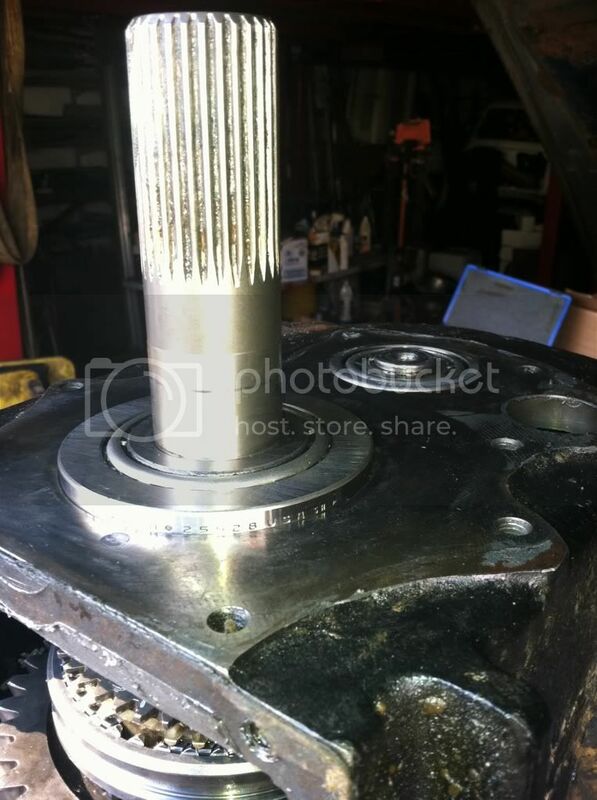 Now its shaft with a new bearing drove on its front. Don't worry it won't go but one way. Make sure the bearing points outward. I turn the case on end an install the other bearing. I also have a small piece of brass backing the other side of the shaft,this keeps the force from driving the other bearing on off of the race snap ring. 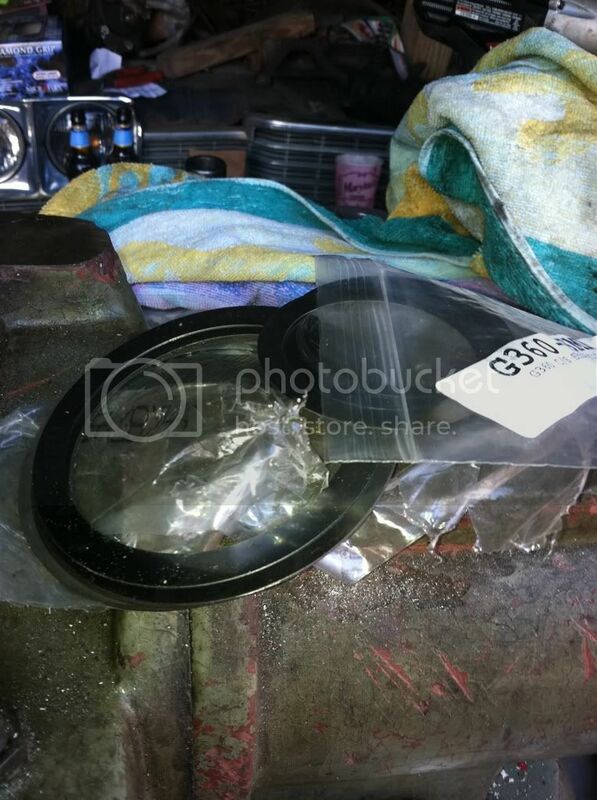 After I get done driving on the bearing,I set the case back down and install the input and its bearing. There is some syncro teeth on it that have been machined down to allow it to move above and forward of its matting counter gear. Once its in there,its time for the mainshaft assembly,careful of that 3/4 syncro assembly. I also install the input race and retainer. Also the cap for the front counter shaft bearing,I put a good layer of Ultra Grey silicone on the outside of it as well. I don't like oil leaks and definitely not on my trans. first, press all the new bearings on the main and counter shaft. 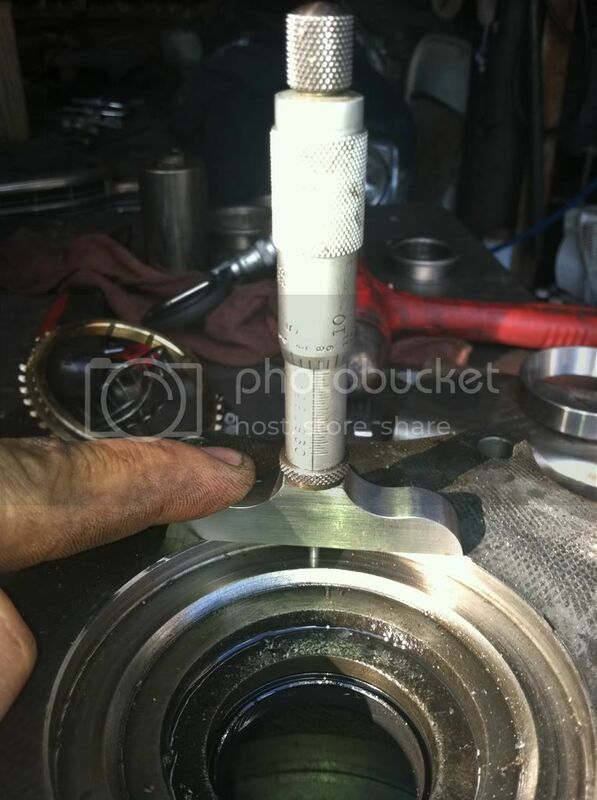 make sure the bearings are FULLY pressed on to the shafts. install the input bearing retainer, front counter shaft retaining snap ring and put the races on the rear bearings. set the trans on its nose so that both shafts are vertical. note: I did all of this with the bearings dry, so that no oil would effect my measurements. 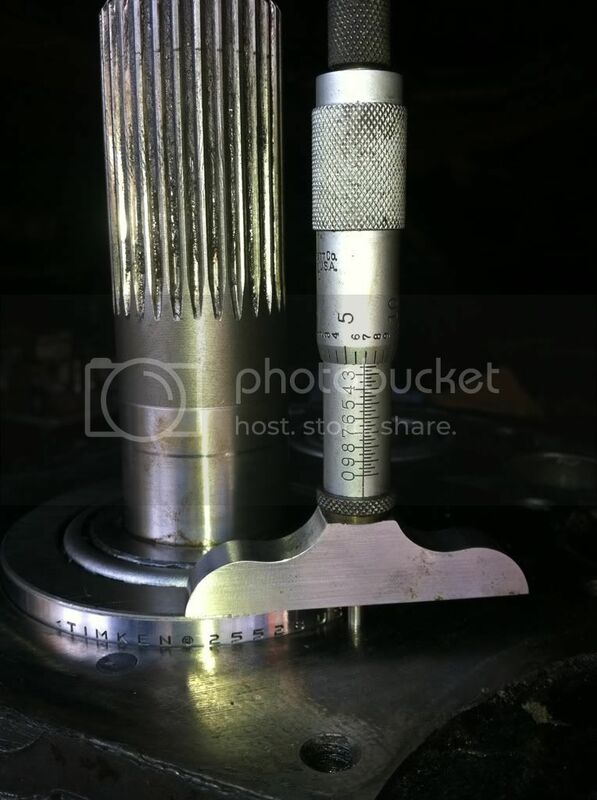 Next, you need to measure the protrusion of the main and countershaft races. used a depth micrometer and check many places on the race to get an accurate reading. I found that the countershaft race was set in the case more and would not rock. But the main shaft race rocked 2 thousands of an inch. therefor I got the average of all of the measurements. it is SUPER important to get these numbers right. any doubt, check it again. next, you will need to measure the depth of the machined counterbores in the tail housing casting. these numbers should be very accurate around the curcumferance of the bore. REMEMBER this is the amout of shims you would need for ZERO preload. the preload I used was .005, hence to get the correct prelaod you need to add .005 to .022 and I needed .027 inches worth of shims. add .005 to .061 and .066 is my final shim requirement for the counter shaft. I bought a main and countershaft shims from ZBAG, they were about 7bucks each and well worth it. ALLTHOUGH, they didnt have any shims for the countershaft over .010.
your job should be complete, have someone check your math and the n your ready for assembly. just to check... I put the tail housing on for a mock up run and used a feeler guage to check how much the housing was wsitting off of the case. 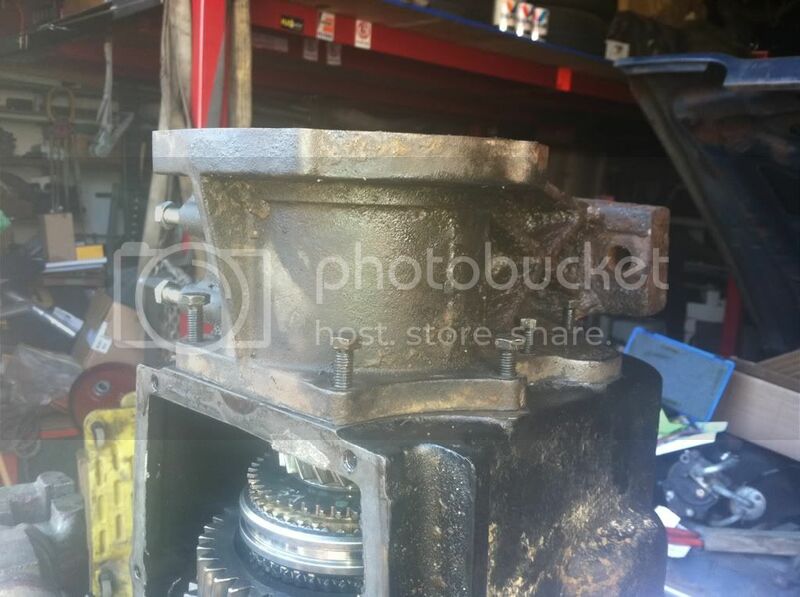 Ok only thing different from that to a 2wd is our output shaft and tail housing. Also don't over do it on the silicone on the tail housing and use the ultra grey stuff. That mess is bad news once it dries. Seems like the other stuff,blue or red, like to be a little porous and let oil out. The ultra black is pretty good but I favor the grey for the simple fact that most auto manufactures use it for most of their sealing requirements now days. One final thing make sure you dab a little between the nut and yoke,ever notice the yoke being damp with oil,it'll stop that . And loctite the nut treads. I've had mine back off a time or two. Last thing to do is to drop you shift cover back on and tighten it up. Finished. Good luck with yours. Last edited by ellis93 on Fri Jan 05, 2018 11:30 am, edited 4 times in total. Ellis, hope you do as I suggested and open up the slot(s) in the input a bit. Also, it may be overkill, but if you PLAN to tow heavy, have the case magna-fluxed, it's worth it. I'd also like to see a pic of how the input is trashed on the backside, just for reference of the biggest troublemaker for the Getrag. A word of warning (advise), don't lose, or screw up the yoke nut. They are not available new (that I have found) and in a box of random parts they usually end up missing, which also means they are hard to come by used. To this point I have yet to find anything even close to this nut. Mark Nixon wrote: Ellis, hope you do as I suggested and open up the slot(s) in the input a bit. I've been thinking on it some and I'm figuring on doing it. If there is only one slot in the new one,there WILL be two when its install in the trans. Clean your bloody hands get on the real computer! Good writeup Mr. Ellis. You should add that there is a flat side on the input shaft gear that should go "down" for better movement forward when disassembling. Also, be careful when driving on the countershaft shaft. If you get near the edge, you can break off the lip of the snap ring groove going in or out with it. PToombs wrote: Clean your bloody hands get on the real computer! Good writeup Mr. Ellis. I'm gonna try and fill in some more in the next couple of days of how to pull the syncros off the 1st and 2nd gear faces and some of the reassemble of the mainshaft. I may ask alex to edit his post on here with his preload measurements and pics off of his trans tread, would ya alex huh huh huh please. im sure the preloads are the same, Just don't know if the size or position of either race is different? Last edited by ahale2772 on Wed Feb 15, 2012 9:53 pm, edited 1 time in total. I'll copy and paste as a quote. 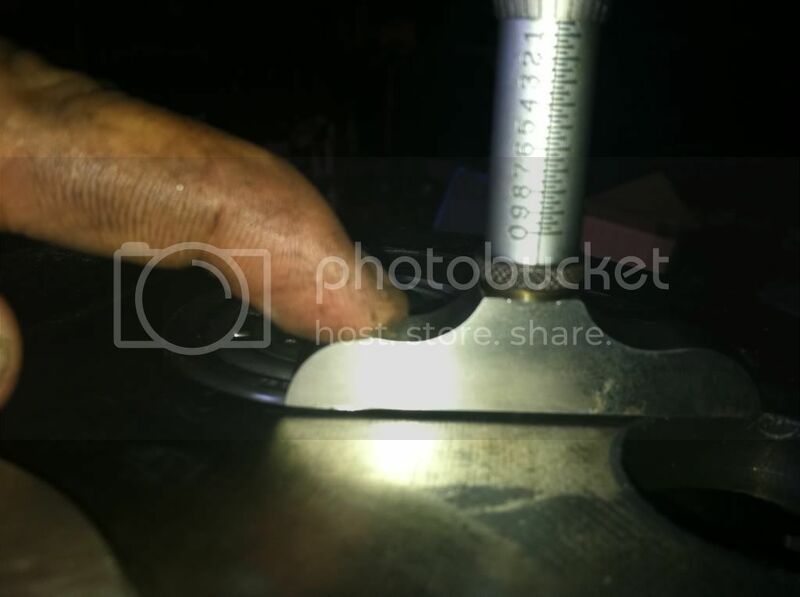 A piece of thinwall conduit, or even a section of mild steel plumbing pipe, that fits just inside the outer diameter of the inner race will allow a person to hammer the bearing onto shafts evenly. This is given that a person doesn't have a taller press to push them on with instead.